For all of you who "truly" know me, know how much I love spending time in my yard! It doesn't matter if I'm mowing the lawn, pulling weeds or pruning my roses...I love being outside! Since I was young I have spent MANY long, hot hours working outside and let's just say it's my favorite part of summer. I had to post a recent picture of my roses. What a beautiful sign that summer is finally here. 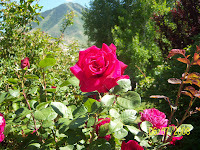 So, to all my family and friends....enjoy the hot, sunny, summer days and don't forget to "stop and smell the flowers! You always have good looking roses....I kill mine. It's all in the TLC.....You never loved the yard like me, maybe because it brings back bad memories of me beating the crap out of you. Sorry!!!! !